Being in the back of an ambulance was second nature...usually. He could expertly insert an IV while swaying on the balls of his feet along with the uneven surface of asphalt as the sirens screamed their presence; report vitals on the bio-phone with the receiver held between his ear and his shoulder while adjusting the drip; note every turn in his mind, where they traveled and on which street, calculating the time and distance to Rampart. _Today the air in the box smelled stale; the aroma of blood nearly overwhelmed him. He felt every single hair on his head as though super charged with anxiety creating a bizarre sensation that each hair stood on end, which only served to heighten the discomfort. If anyone saw him right now he knew they would notice he needed a haircut. Glancing down at his blood stained hands sent a shudder through his normally controlled sense of professionalism. In his mind he knew the sheet white pallor of his own skin and the shell shocked look on his face; he’d seen it on too many family members of critical patients. There was nothing he could do to ease his raw emotions or his racing heart. This was not some stranger he valiantly tried to keep alive in transport...this was Drew. 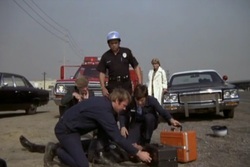 _Never in his wildest dreams of becoming a paramedic had Johnny ever thought he would be in this position. He knew he would be in precarious situations where he would literally be holding the victim's life in his hands, but never in his imagination did that include a friend. 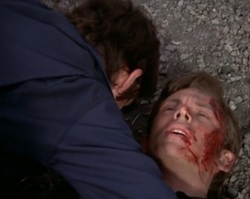 Sure he was a policeman...and sure that job was dangerous, they teased each other about the dangers of their jobs all the time, but Drew was never supposed to get hurt. That didn't happen to good cops. Did it? The slight tremble in his hands that started at the scene returned with a vengeance and now extended to rack his entire body. 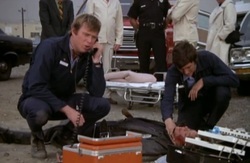 Thankfully he had a minute before he had to re-check Drew's vitals. Resisting the urge to rub his palms on his eyes, Johnny instead scrubbed them hard on the fabric of his uniform pants, rolled his shoulders and sucked in a deep breath. The tinny taste of blood seemed to taint the air making his stomach roll. _That’s why he started that second IV. He had to do something to give his friend a fighting chance. In his heart he knew Roy couldn’t have made Rampart take their transmission over the heart call, but right now he just wanted to blame someone. _Speaking of blame that woman had declared the whole thing Drew’s fault for insisting on pulling her over making her late for her bridge game. That in itself was enough to make him lose all of his professional composure. ‘If she had been a man I’d have belted him.’ Damn the job…this was Drew. He ran his hand through his hair trying to make it lay down. Several passes and he still felt the roots on high alert. The peculiar feeling only served to increase his agitation. He still couldn’t believe the scene they had rolled up to. There was no way to know it would be a friend. The squad pulled up behind the cars parked on the shoulder; as usual they got out, pulled their gear from the compartment, turned to someone for information about the victim, and there on the ground barely awake laid his friend. _Johnny immediately spoke to his friend; tried to comfort him; to reassure him that they were there to help, but immediately he knew in his heart things weren’t good. His assessment was quick and precise. Not only was there apparent scrapes, cuts, road rash and severe bruising, there was evidence of internal injuries. Drew’s vitals were in his boots, and they needed to move fast. They needed to get him to Rampart yesterday. Drew kept trying to make Johnny promise to tell Pam how she was the best thing that ever happened to him. Those words tore at Johnny’s heart. Johnny tried to convince Drew that he would tell Pam himself…or was he trying to convince himself. When he met Drew back when he was still a boot at Station 10 they had hit it off instantly. Johnny was at Rampart waiting for a ride back to the station when Drew’s daughter Becky had been brought into the ER, and before leaving they had challenged each other to a bowling match with steak as the grand prize. ‘I beat your pants off that day.’ On the way to Drew’s house to grill his prize they stumbled on a house fire. They worked together to get everyone to safety and showed up at Drew’s place soot covered and tired. He had been worried that Drew’s wife wouldn’t like him, but Pam had been wonderful and understanding. That was the beginning of a very close friendship between the three young adults. ‘She can’t lose you.’ His heart ached at that thought. He had to make sure that didn’t happen. He owed that to them. He didn’t want little Becky to grow up without her daddy. 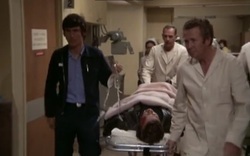 “Come on Drew…hang in there buddy.” Johnny whispered to the non-moving man on the gurney. He reached for his wrist and counted again. ‘Too slow.’ He checked the flow on the second IV, and carefully secured the oxygen mask over his face taking great care not to rub against the open welts the road left behind. He swallowed several times trying to keep the sickness he felt in check as he pumped up the blood pressure cuff only to find the two IV’s were not helping as much as he’d hoped to stabilize his friend. The air hissed when he let it out. It mixed with the soft buzzing already in his ears. He blinked several times and quickly willed himself back to complete awareness. In a whirlwind of activity the gurney was in motion; before Johnny even realized it, he was moving, his feet were on the ground and they were running alongside. _“In here,” Dixie held the door open. Johnny robotically transferred the IV bags to the stand. Dixie placed her hands on his chest and gently moved him toward the door. “Don’t you have a blood tap to get to the lab?” Johnny nodded absently, but his training kicked in. He turned and hurried from the room, but not before taking one last look at his friend.